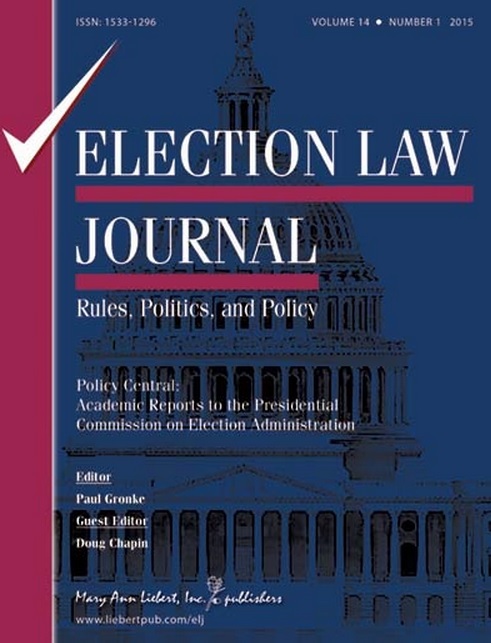 Over the last several months, I have been working with my friend and colleague Paul Gronke, editor of the Election Law Journal, to produce a special issue focusing on some of the research that helped inform the Presidential Commission on Election Administration. The issue is intended to mark a new approach for the Policy Central section of the journal, which I am hoping to develop as a resource for scholars and practitioners alike on the emerging issues in the field. As a longtime scholar of election administration issues and a self-described “election geek,” I was delighted to hear of the administration’s interest in the field–but as someone familiar with the politics of the issue and the ways of Washington, I was anything but optimistic about the prospects for movement, let alone success. Imagine my reaction, then, when I found out that the White House was not only going to appoint a bipartisan commission but ask two of Washington’s most well-respected election lawyers, Ben Ginsberg and Bob Bauer, to co-chair the effort. My joy wasn’t merely a function of their reputations; I’ve known both gentlemen for years–Ben was my election law professor at Georgetown, and Bob and I worked together during my time on Senate Rules–and I’ve learned that despite their public associations with partisan causes, they are both deeply committed to the American system of democracy and the voter’s role in it. • commitment to better use of data and a sense of professionalism in election administration. The PCEA has been rightfully lauded for its work in assembling the report, which is already making an impact in legislatures across the nation. And yet, one vital aspect of the PCEA’s work hasn’t gotten enough attention: the contributions of a group of scholars whose work helped inform the Commission’s deliberations. This special issue of Election Law Journal is designed to remedy that by giving several of those scholars an opportunity to share their work with a larger audience. A Brief Yet Practical Guide to Reforming U.S. Voter Registration Systems (Daron Shaw, Stephen Ansolabehere, Charles Stewart III) – Those looking to improve the performance of elections in the United States often point to issues involving the voter registration system. A review of this system reveals that it is massive, decentralized, and vital to democratic functioning. The existing scholarly literature, coupled with our own reading of data from the 2012 elections, suggests several ways of improving the system, including adopting online registration for voters, using technology to improve lists and list management, working with private vendors to assess and improve the quality of registration lists, and developing a national list to facilitate analyses of administrative performance and best practices. Presidential Commission on Election Administration: Absentee and Early Voting: Weighing the Costs of Convenience (Barry C. Burden, Brian J. Gaines) – Absentee and early voting are increasingly popular in the United States. Most states have embraced one of these options to make voting easier. Absentee voting is often marginally more convenient and might be less expensive to administer, but it also carries unique costs in terms of ballot insecurity, higher odds of error and fraud, and a concomitant reduction in public confidence. States intent on making the act of voting easier should prefer in-person early voting to absentee voting, while continuing to focus on improving the experience of Election Day voting. The Quantities and Qualities of Poll Workers (Barry C. Burden, Jeffrey Milyo) – Successful election administration depends on an army of poll workers who are responsible for front line interaction with voters at the polling place. Despite their important role in elections, we know surprisingly little about how recruitment and training of poll workers translates into performance. We review research on poll workers and present descriptive information about poll worker characteristics, recruitment, training, and evaluation. We suggest that widespread concern about the quantity of poll workers has distracted from examining the quality of poll workers. More systematic evaluation is necessary to understand how various inputs affect poll worker performance. Waiting to Vote (Charles Stewart III, Stephen Ansolabehere) – We review evidence that long lines waiting to vote in the 2012 presidential election were costly and disproportionately appeared in certain regions of the country, in cities, and among minority voters. We argue that the field of queuing theory helps to frame thinking about polling place lines. Because addressing the problem of long lines requires precise data about polling place dynamics, we conclude by suggesting new approaches to research that are necessary to identify the most effective cure for long lines. Voting by Overseas Citizens and Military Personnel (Donald S. Inbody) – The wide variation in state election laws poses serious obstacles to voting for overseas and military citizens. While issues with delivering an unmarked ballot remain, the principal problem is how best to return a marked ballot from overseas and military voters to local election officials in sufficient time to be counted. The Presidential Commission on Election Administration recommended that states distribute ballots and registration materials to overseas citizens and military personnel via specially designed and easily navigated websites. Despite the lack of guaranteed electronic security, the peculiar needs of citizens living overseas and military personnel raises the prospect of using the Internet for communication and document delivery. Accessible Democracy: Reducing Voting Obstacles for People with Disabilities (Lisa Schur, Meera Adya, Mason Ameri) – Citizens with disabilities are less likely to vote than their non-disabled peers, and are more likely to experience difficulties when they do vote. This article reviews the evidence on voter turnout and voting difficulties among people with disabilities, finding that nearly one-third of voters with disabilities who voted in a polling place in 2012 experienced difficulties in doing so. We summarize best practices for removing voting obstacles, including measures to increase polling place accessibility, train election officials in disability issues, educate people with disabilities about the voting process, and increase the availability of no-excuse mail ballots. Given the size and expected growth of the disability population, such measures are needed to make the voting process more fully accessible and ensure that all American citizens can exercise the right to vote. Election Administration During Natural Disasters and Emergencies: Hurricane Sandy and the 2012 Election (Robert M. Stein) – What steps can and do local election officials take to prepare for and respond to natural disasters and emergencies that impede and disrupt the operation of scheduled elections? How efficacious are these actions and practices, and to what extent, if any, can these practices be generalized to the 3,000+jurisdictions charged with conducting elections? In this article I address these questions by examining the conduct of the 2012 presidential election in the aftermath of Hurricane Sandy. I find several correctives for the disruptive effect of emergencies and natural disasters on voter participation including state laws that afford voters opportunities to ballot before Election Day and the number and staffing of polling places. These correctives provide clear guidance for the conduct of elections outside of natural disasters and emergencies. The issue concludes with a short “Word from the PCEA Co-chairs” Bob Bauer and Ben Ginsberg that reiterates their hope that the Commission’s work will continue to inform the field and laying out their vision of how the PCEA’s conclusions can influence policy change affecting elections. I also want to recognize the (anonymous, but you know who you are) practitioners in the field who helped with review of these pieces, offering thoughtful – and sometimes very critical – feedback of the work. That dialogue is valuable in and of itself and I’m grateful. Currently, the issue is available online just to subscribers but I am hopeful that selected articles may be briefly “ungated” online very soon. Thanks to the authors, the reviews, PCEA members – and everyone at ELJ – for their work in bringing this issue to publication. Go check it out! Next: Oregon’s Automatic Registration is Law: Now What? 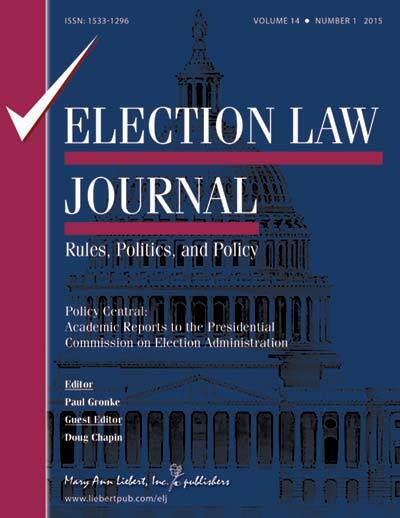 Be the first to comment on "New Issue of Election Law Journal Features PCEA-Themed Research"